Well, maybe… after a decade of being stuck at $417,000 (although it is higher in the “high cost” areas determined by the government), there may be a rise in the conforming limit. We’ve been down this road before, but it could happen this time. Why? During the height of the housing boom, many talks focused on raising the limit over $417,000. We all know what happened next… housing crash, home values plummet, and $417,000 was more in line with the market. Fast forward a few years, and home values are rising again! Some indices show the values are back to pre-recession levels. With home values rising, the Federal Housing Finance Agency (FHFA) is considering the increase in conforming loan limits. This could help spur home purchases. Why? Conventional loans come with smaller down payment requirements than Jumbo loans. Conventional loans typically have better interest rates than Jumbo loans. This makes it easier to qualify for a Conventional loan than a Jumbo loan. Home buyers moving up to a pricier home are more comfortable using a Conventional loan. The FHFA will decide this fall on whether or not to raise the conforming loan limits. If so, look for increase to begin for new loans starting January 1, 2016. In my previous blog post, I reviewed recent home price increases and how they can lead to jumbo loans. We also covered how jumbo loans typically have higher interest rates and down payment requirements as compared to conventional loans. So what do you do if you need to borrow more than the $417,000 conventional loan limit and you don’t have enough cash to make the 20% down payment required for a jumbo loan? Under certain circumstances, you can obtain a conventional first mortgage of up to $417,000 and then acquire a second mortgage for the remaining balance. The second mortgage will have a higher interest rate than the first loan, but you may pay less in interest as compared to a jumbo loan. Dunwoody Mortgage Services will only provide the first mortgage, but we have lending partners who work with us to deliver this type of secondary financing. One key criterion is that the borrower must have an excellent credit score. For example, one of our partner lenders can allow total liens (first plus second mortgage) of up to $750,000 when the borrower has a minimum 740 credit score. This lender can allow total liens of up to about $917,000 when the borrower has a minimum 760 credit score. In each case, the borrower must make a 10% down payment – less than the 20% down payment required for a jumbo loan. But if your credit score is less than 740, you will not qualify. Clear as muddy water? Here is an example to better explain. Let’s assume (1) you have a 775 credit score, (2) you want to buy a house with a price of $835,000, and (3) you have $85,000 of available cash for a down payment. So you must borrow $750,000 to buy the house. To get a jumbo loan, you would have to have $167,000 in cash for the down payment. And your interest rate (on the day I’m writing this) on your jumbo loan would be about ½ a point higher than a conventional loan rate. But with only $85,000 available to you, the jumbo loan just won’t work. But with the second loan strategy, you might be able to make an $85,000 down payment, obtain a first mortgage of $417,000 and a second mortgage of $333,000, bringing your total amount borrowed to $750,000. Your interest rate (today) on the first mortgage would be about ½ a point lower than a jumbo rate, and you may be able to get a rate on the second loan that is comparable to the jumbo loan rate. If you want to buy a more expensive home and you need to explore your financing options, give me a call at 770-634-0992. Comparing different financing scenarios is just a part of the outstanding service we deliver to our customers every day. I look forward to talking with you. More than half of the new home price increase in recent years is caused by changes in the size and quality of new homes. Average new home sizes have increased while the size of the average American household has decreased. Government policies (such as mortgage interest deductibility) may encourage the trend of larger new homes. While new home prices have increased more than 100% since 1970, if you adjust for the home size, the price increase is only 23% after adjusting for inflation. As home prices rise, this pushes more buyers into the jumbo loan category. So what is a jumbo loan, you ask? A jumbo loan is defined by Fannie Mae and Freddie Mac as a mortgage amount greater $417,000 in most areas of the country. (The limit is higher in certain high-cost locations like Hawaii and Alaska.) Our lenders will process jumbo loans in amounts up to three million dollars. 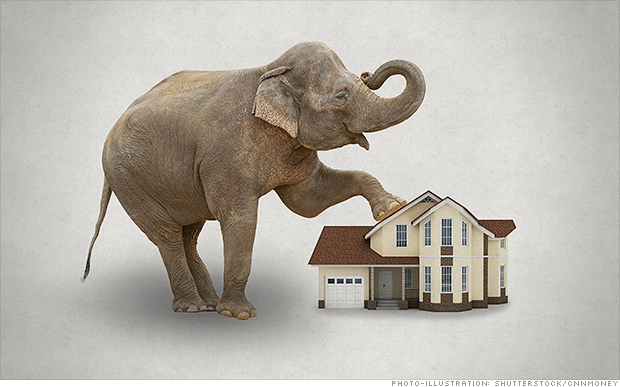 So what does it mean to you if you need a jumbo loan? First of all it affects your down payment. With conventional loans, lenders will allow you to put as little as 3% down on your purchase. With jumbo loans, the minimum down payment is significantly larger. Secondly, obtaining a jumbo loan often means that you pay a higher interest rate. On the day I am writing this, with all other lending criteria being equal, the difference between a jumbo and conforming loan is about one half of one percent for one of our lenders. So as are looking to move up to a larger home, remember the rules for a jumbo loan differ from those you had when obtaining your current conforming or FHA loan. Give me a call to discuss your options and loan pricing. And keep an eye out for my next blog post where I will discuss ways to stay within conforming loan limits to avoid the higher cost jumbo mortgages.